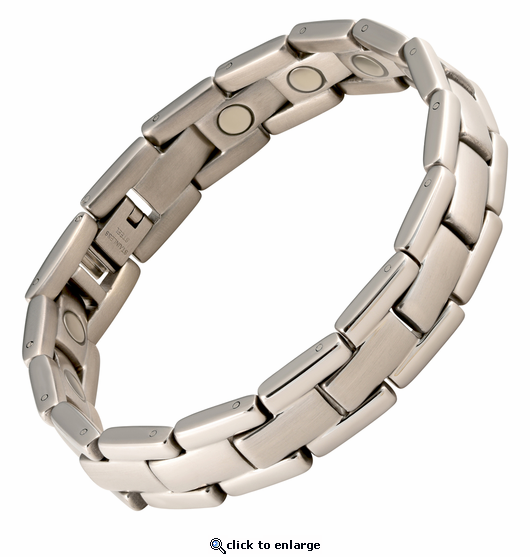 This is a silver solid stainless steel magnetic bracelet. It has shiny silver edges with a matte silver center, and is quite substantial at about 1/2" wide. This magnet bracelet has a powerful & permanent 3300 gauss neodymium rare earth north facing magnet in each link.. The purchasing process was quick and easy and the bracelet arrived when expected. So far the quality of the bracelet appears to be excellent and as nice as pictured. Thanks for a great buying experience! Had one for 15 years, and lost it. Always helped with my elbow and shoulder. this is my 2nd bracelet. had the first for 3 years broke it at work. lasted longer then I really thougt it would. never took it off. don't plan to go with out it again. Bought this for myself, matches design of my ring. Love the bracelet, Good looks, nice heavy feel, just right, strong clasp, have no fear of it opening accidentally. Pleasure to wear all day. Gave this to my husband for his birthday and he loved it. It fit him perfect. I would defintely recommend it. He told me that he actually is feeling better. This company will go out of their way to see that the customer is fitted properly and happy.....product delivered quickly and matches description. My suggestion to improve this product would be to strengthen the clasp. I am a golfer and a tennis player and it has flown off my wrist on two occasions already due to the flimsy clasp and loose connection.Reply By MJS: This is rare. Either you have the wrong size, or maybe you have a rare loose clasp. We are glad to repair or exchange. I purchased these for my husband and myself for Valentines Day. We absolutely love them!!!!! I personally did not buy them for the magnetic qualities but because I needed a well crafted bracelet that would hold up to my busy lifestyle which does not include fussing with delicate sissy jewelry. My bracelet is very feminine and beautiful as well as sturdy and not afraid of water!!!! I LOVE IT!!! My husband loves his too ! I had it re-sized by a local jeweler and coated the magnets with clear nail polish. Know it work fine, Thanks for you concern. This is an awesome bracelet; I have not taken it off yet. I had some pain in my wrist so I thought I would try one of these Magnetic bracelets. And after three weeks, I have had little or no pain now. Not sure if it is from the bracelet or just because it looks great, but it works. And the style of this looks just as good as the photo. I am going to buy a few more just to have. I love it, I would rate it a 5. I will be ordering more later, thanks. I was very satisfied with my purchase (Men's magnetic bracelet #43)). They were forthright with my specific questions, and customer service was better than most. Important these days when everything is bought over the internet. . As far as the product...I have to say it works. I have to open a ton of boxes and lift a lot of heavy things at work, and my hand was beginning to ache in one or two finger joints pretty consistently. On a whim, I tried out this nice size bracelet. In a day, maybe less, I noticed my hand didn't hurt after work, and a few weeks later, that is still the case. I cant say whether it is a placebo effect, or it actually works....but luckily there is little difference. It should be noted that I detected a significant magnetic field with a compass near by the bracelet, it was very local. be sure not to lay it down on a cell phone,computer, etc....oh yeah, and looks great too! I wanted a powerful magnetic bracelet for arthritis relief, and was so pleased with the first bracelet I ordered, I ordered a second one, identical to the first, and I wear them side by side. Together they provide a 6600 magnetic gauss rating, and no other bracelet could ever claim to be that powerful. I encourage others to try this approach to pain relief. You have nothing to lose, and everything to gain! It doesn't seem to be helping,but I'm not giving up just yet.I wear them everyday & night never take them off. Reply By MJS: Please do read the info we included, if we can help, please let us know. i think this is the best magnetic bracelet i had and for the price it's great! This bracelet looks excellent and of much better quality than some we had looked at sold by other vendors. It was a birthday gift for my son and looks so nice on him. The quality is great for the price! I would recommend Magnet Jewlery Store to everyone. Thanks. great quality, better than I expected for the price. I have had RA for 2 years now and after wearing one of these i can close my hands like when i was well,i dont get it ,i didnt believe in it ,and now i am getting my family to wear them ,because i am still in denal ,and wondering if my RA is going into remission ,but if this works for my family also i guess i will just have to believe in the unknown . I admit, when I first put this bracelet on my wrist, it did generate a strange sensation in my hand, and later my lower extremities, but a day later, my joints are thanking me for wearing it. As someone whose job is mostly typing, I greatly appreciate this item. Attractive style as well. this item was a Christmas gift to our son. The style was manly looking which was great looking on his wrist. Within 30 seconds of having it on his wrist he was feeling effects from the magnets which I feel was incredible. So I know I will be ordering again. Thanks for a great products with a great price. I purchased for an elderly gentleman friend. He was complaining of pains in his wrist. I told him about my bracelets and recommended he try this one. He was extremely surprise how nice that it looked, especially for the price. He has never taken it off. He said within a couple of days the pain was totally gone and hasn't returned. He has worn it for a couple months now continuously. He has never tarnished either. Looks as good as the first day he put it on. I love this company!!! I have purchased 4 items for myself. I purchased a bracelet for my elderly mother & this elderly friend. Customer service is super GREAT!!! I love all the products!!! And all of us with arthritus find that the magnetic jewlery helps greatly! Frankly I have not used the bracelot yet as I made anerror in sizing. The Company graciously told me to return it, they would fixit and return it to me all with no additional charge. What a great attitude. It is great doing business with people like that. Nice looking bracelet. A bit too long for me so I had to reduce the length in local jewelry store and remove one cell which have cost me 50 % the price of the bracelet, but for future orders I will know the correct size. I wear it most of the time. As I bought this product for magnetic healing purposes, I rate this product 3 star as I have not felt any benefits yet. I also expected more elegant gift box. Customer service and delivery time were perfect. Reply By MJS: We are always glad to re-size jewelry if needed at no charge. Nice,, I wear it all the time, even at work as a heavy mechanic. i order size 71/2 u send me a size 8. Reply By MJS: As we state on our site we ask for your wrist size against the skin without adding extra and we then make the bracelet a bit larger. Our size options state- wrist size - bracelet made larger. This enables us to custom size each bracelet. Not all people know the bracelet should be a bit larger, but everyone can get their wrist size. We are always glad to re-size jewelry if needed. I bought this bracelet as a part of a birthday present and it got rave reviews!! I have arthritis in my right sholder and in the motion of moving my arm i feel pain and cannot drink orange juice because citric acid inflames it. Well the pain has diminished GREATLY ! and i have not stopped wearing the bracelet since i got it . I have felt like i had surgery or something only w/o the long delay of rehab. I am of course enjoying it's benifits tremedously.plus the fact that it was a tenth of the cost of one i was considering buying. Well thats if i bought it at your regular price.